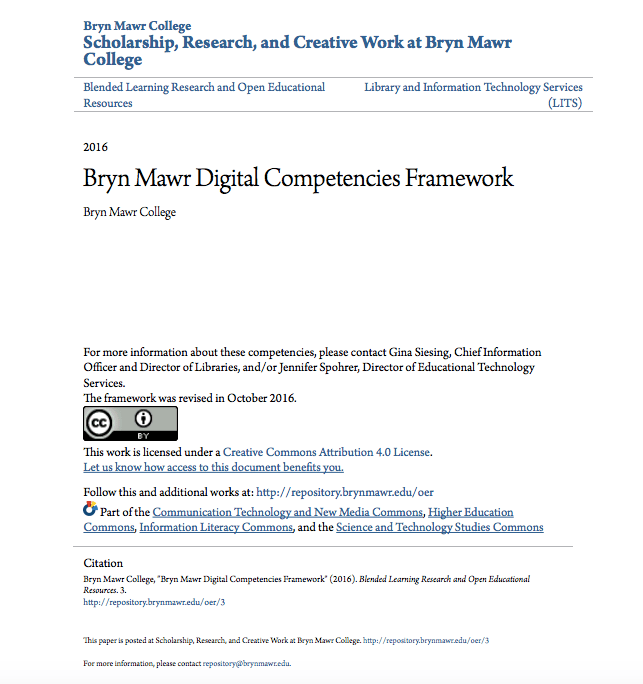 This copy of the Bryn Mawr Digital Competencies Framework is being provided as part of an annotation project through #DigPINS. If you are not seeing annotation options then go here and wait for the page to reload. Maybe highlight some of the competencies to reflect how something you do in class (or something that you would like to do) helps students to build that competency, comment on the importance of a competency, or reflect on ways that you see students build a competency outside of class. Members of Bryn Mawr College’s IT department/Library who developed the framework will be joining us: Gina Siesing the CIO and Director of the Library, along with, Beth Seltzer educational technology specialist will be checking in on our annotations a few times throughout the kernel and engaging with us. Develop ways of articulating and demonstrating their competencies to various audiences. The framework is designed to be comprehensive and suggestive, but not a checklist that all students must complete before graduating. First, while we believe all students should develop the competencies listed as Digital Survival Skills, the other four areas of focus (Digital Communication; Data Management and Preservation; Data Analysis and Presentation; and Critical Design, Making, and Development) may be more or less relevant to different students, depending their academic, professional, and personal interests. Second, digital competencies are by nature open-ended and evolving. They change as technologies change: networking and file management, for example, looked very different fifteen years ago, before “cloud” storage options like DropBox, iCloud, or OneDrive were widely available. The framework is an invitation to and a tool for students to reflect on the digital skills and critical perspectives they develop while in college. Bryn Mawr College students currently develop, and will continue develop, these skills and perspectives in different ways and through both curricular and co-curricular experiences. For example, one student might develop data management skills while conducting field research for a course project, but her peers might develop them working in Special Collections or interning for a non-profit. Some students may find in the framework new ideas for working with or thinking critically about digital technologies and seek opportunities to explore them. Others will recognize skills they have already developed and find language to describe them to different audiences. This emphasis on reflection and on finding synergy between curricular and non-curricular draws inspiration from the mission of Bryn Mawr’s Leadership, Innovation, and Liberal Arts Center (LILAC), which will be a key partner in developing student-focused programming related to the framework. Although the audience is primarily students, the framework can also help Bryn Mawr College faculty and staff identify existing curricular and co-curricular opportunities to develop digital competencies, and mindfully incorporate such opportunities into new courses and programs. Developing effective strategies for improving digital skills using on a range of methods, opportunities, and resources. 1.3 Troubleshooting Troubleshooting is a logical, systematic search to determine the source of a problem and how to fix it. Becoming familiar with and comfortable using a range of digital collaboration tools, such as filesharing systems, collaborative editing and annotation tools, discussion forums, blogs, online chat, or web-conferencing. Learning and using a range of methodologies to critically analyze images, film, audio recordings, animations and other audiovisual “texts” and how they are used. Becoming familiar with and comfortable using a range of tools for publishing and sharing digital audiovisual content, and learning to identify those most appropriate to given audiences, topics and content. Learning to effectively use digital tools for collecting and recording data, such as online surveys, audio and video recording devices, and GPS-enabled cameras. Developing appropriate ethical and legal guidelines for using confidential or proprietary information and personal likenesses, including those involving minors. Developing and practicing strategies for protecting your own data and data entrusted to you against theft, misappropriation or loss. Learning how to secure digital devices (laptops, smart phones) and accounts (college account, Gmail, etc.) against intrusion and loss. Learning how to identify sensitive information (e.g., personally identifying information, financial information, educational information) that requires higher than usual levels of protection. Learning to efficiently clean, revise and manage data without danger of losing or overwriting it. Developing effective strategies for backing up and version control. Learning why and how to use unique identifiers and controlled vocabularies. Learning to find, read, and critically analyze information about data, files, and digital objects that is stored in metadata, including data related to copyright and privacy issues. Developing a working knowledge of metadata or tagging schemas used with bibliographic records; images, files and other digital objects; datasets or texts. Becoming familiar with and comfortable using a range of software tools for creating and manipulating data, such as Excel, MySQL, SPSS or ARCGIS. Learning how flat and relational databases are structured, and how to filter, sort and query these databases to find relevant information. Becoming familiar with and comfortable using a range of software tools for analyzing data, such as Excel, MySQL, SPSS, ARCGIS or R Studio. Learning to critically interpret and evaluate arguments or meaning constructed through various different visual representations of data (e.g., charts, graphs, maps, timelines, infographics. Developing this competency involves learning to interpret, edit and articulate a set of coded instructions for a computational system or device to execute. Becoming familiar with a range of creative, iterative, goal-oriented design processes for creating, testing and refining new ideas or solutions to problems. Becoming familiar with a range of strategies for scoping and shaping a project, organizing collaborative work on it, and guiding it from idea to culmination. Developing a personal “toolkit” of strategies for managing individual and group projects. Becoming aware of both traditional and emerging processes of knowledge creation and dissemination in a particular discipline. Developing first-hand experience with the digital tools and technology-enabled-methodologies that are transforming disciplinary research.10 Examples include textual analysis, topic modeling, network analysis, GIS, and the creation of non-linear narratives and arguments. 1 This document incorporates information literacy knowledge practices and dispositions from the Framework for Information Literacy for Higher Education developed by the American Association of College Research Libraries (ACRL). 2 “Information Has Value.” Framework for Information Literacy for Higher Education. 3 “Searching as Strategic Exploration.” Framework for Information Literacy for Higher Education. 4 “Information Has Value” and “Scholarship as a Conversation.” Framework for Information Literacy for Higher Education. 5 “Information Has Value.” Framework for Information Literacy for Higher Education. 6 “Searching as Strategic Exploration.” Framework for Information Literacy for Higher Education. 7 “Research as Inquiry.” Framework for Information Literacy for Higher Education. 8 “Information Creation as a Process.” Framework for Information Literacy for Higher Education. 9 “Information Creation as a Process.” Framework for Information Literacy for Higher Education. 10 “Information Creation as a Process.” Framework for Information Literacy for Higher Education.